It is hard to imagine that Facebook was launched this day 10 years ago in a Harvard dorm room. At that time it was called TheFacebook.com and it was a website where college students could create profiles for themselves, connect virtually as “friends” and send one another messages. It wasn’t the first social network, however, it was the one that changed the way people connected online. With no immediate plans to make money Facebook’s first profit turned in 2009. In 2013 Facebook reported a profit of $1.5 billion on nearly $8 billion in revenues. In December 2004, Facebook reached 1 million users. High school students joined in September 3, 2005. In October 2005, Facebook launched Facebook photos. In April 2006, Facebook for Mobile launched. Facebook opened for everyone September 26, 2006 (grandparents, parents, siblings!). In April 2008, they launched Facebook Chat. February 2009 Facebook introduces the Like button. In December 2010, Mark Zuckerberg was named Person of Year by TIME magazine. September 2011, Timeline is introduced. April 2012, Facebook acquires Instagram. In May 2012, Facebook reaches a huge milestone by holding its initial public offering. 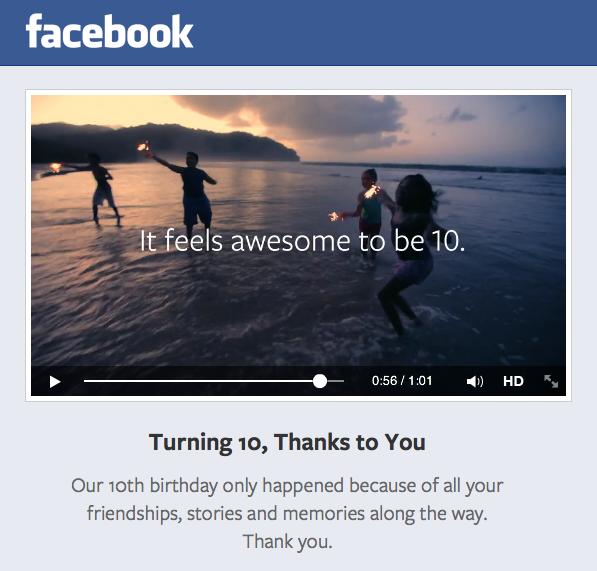 To celebrate their 10th Anniversary Facebook has put together the nostalgic “Look Back” feature. The feature consists of a video, tailor made for each user, showing their most important Facebook moments such as most-liked posts and photos. You can get your own here. What's your favorite feature of Facebook?